Proving there is no limit to how far some couples will go for a one-of-a-kind engagement story, a Miami man decided that just one ring wasn’t going to cut it and instead chose six engagement rings of different shapes and sizes for his future bride to choose from. 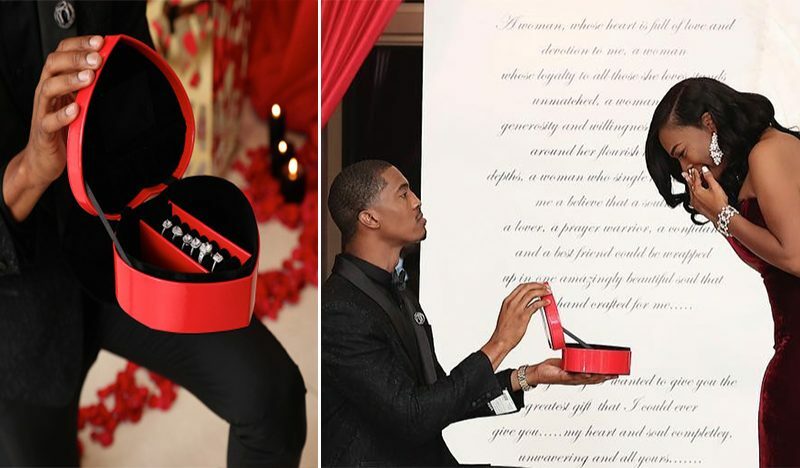 “I won at life with her, so she deserves 6 rings to choose from,” model and former pro athlete Dennis Brown II wrote on Instagram of his decision. 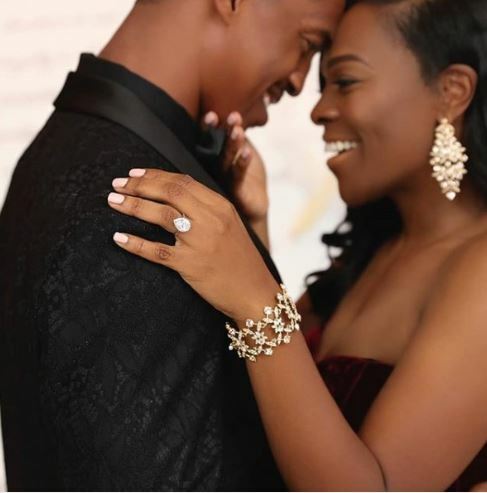 Brown hired a stylist, photographer, florist, and drapery designer as well as an event planner to create the perfect proposal for his soon-to-be-fiancée Atara Dallas. In the series of photos, Dallas, a teacher, and restaurateur appear barely able to contain her surprise when a sharply-suited Brown gets down on one knee and presents her with the super-sized red ring box containing the six engagement rings. The diamond sparklers varied in shape and size, with square, round, emerald and teardrop cuts for her to choose from. Ultimately, Dallas, who was outfitted in a glamorous burgundy velvet gown for the occasion, selected the teardrop design, which featured a large center stone with a halo of diamonds surrounding it and thin band. 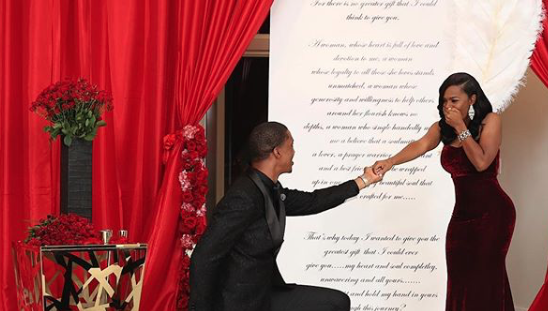 In addition to the bevy of bling, Brown also arranged for the room to be filled with red roses and even designed a floor-to-ceiling script with heartfelt words for the backdrop of his proposal. According to images shared on Instagram, Dallas was shocked by the gesture and the ring selection. She posted several pictures of her fiancé and enormous sparkler, writing that the day was “perfection” and she’d like to “have this moment for life.” However, some netizens on social media suggested the groom-to-be did not know his bride well enough, that’s why he came prepared with so many options.